Welcome to the Council for Economic Education (CEE) website. Included below is our policy on how we handle donor and data privacy. 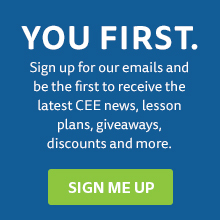 CEE respects the privacy of every individual who donates and/or subscribes to our mailing list(s). Your privacy is a priority, and we go to great lengths to protect it. The Council for Economic Education gathers personal information, such as name, address, email, phone number, and credit card number, only when voluntarily submitted by you. If you make an online donation, personal information will be collected from you in order to process that donation. CEE will not sell, trade, or share personal information about our donors with anyone else, nor will we send mailings to our donors on behalf of other organizations, unless a donor has given us specific permission to do so. If you provide the Council for Economic Education with personal information when you visit our website or make a donation (online or by mail), we will enter your information into our database, so that we can provide you with information about our programs and events, or request contributions. Access to our database is restricted to personnel with legitimate business need to access or modify the information contained therein. The Council for Economic Education is committed to accuracy and precision in processing your information. We employ a variety of error-checking procedures, and our systems are subject to independent external and internal audits to ensure the privacy, security and accurate processing of your information. Please contact us if you wish to review your information, make corrections, or to discuss your preferences about how we contact you. It is our practice to include, in our written appeals and email correspondence, the option to remove yourself from our mailing list. Please note that there may be a brief delay between when you submit your request to opt-out and when it is processed and reflected in our systems; accordingly you might continue to receive communications from us for a limited time after you unsubscribe. The policies listed below commit CEE staff and all official representatives of the organization to the standards explained. All staff and all official representatives involved in the planned giving program are required to read and accept these policies. Acceptance of any contribution, gift or grant is at the discretion of the Council for Economic Education (CEE). CEE will not accept any gift unless it can be used or expended in a manner that is consistent with the purpose and mission of CEE. No irrevocable gift,whether out right or life-income in character,will be accepted if under any reasonable set of circumstances the gift would jeopardize the donor’s financial security. CEE will accept donations of cash or publicly traded securities. Gifts of in-kind services will be accepted at the discretion of CEE. Certain other gifts –real property, personal property,in-kind gifts, non-liquid securities, and contributions whose sources are not transparent, or whose use is restricted in some manner–must be reviewed prior to acceptance, due to the special obligations or liabilities that such gifts may pose for CEE. CEE will provide to donors acknowledgments meeting IRS substantiation requirements for property received by the charity as a gift. Except for gifts of cash and publicly traded securities, no value shall be ascribed to any receipt, nor will CEE furnish any other form of substantiation of a gift. This guideline is aligned with IRS rules and best practices on planned giving. CEE will respect the intent of the donor in regard to gifts for restricted purposes and the desire to remain anonymous. With respect to anonymous gifts, CEE will restrict information about the donor to only those staff members with a need to know. CEE will not compensate, whether through commissions, finders’fees, or other means,any third party for directing a gift or a donor to CEE. The interest of the donor shall come before that of the institution. No program, agreement,trust, contract,or commitment shall be knowingly urged upon any prospective donor when the instrument under discussion would benefit the institution at the expense of the donor’s interests, goals, and welfare. Influence: Representatives of the institution shall exercise extreme caution to avoid pressure, persuasion, or undue influence when a representative is call upon to inform, counsel, and assist the donor with gift planning concerns, prudently considering the donor’s personal interests as well as charitable objectives.All personnel employed by the institution to contact prospective donors or to promote the planned gift program shall be paid a salary or fixed wage but shall not receive commissions that could give such personnel a direct beneficial interest in any agreement. Any personal, financial, or beneficial interest that may accrue to institutional personnel as a direct result of the development of relationships for which personnel were deployed as a condition of employment shall be considered a benefit transferable to the institution. Legal counsel: CEE will refrain from providing advice about the tax treatment of specific gifts. Prospective donors shall be advised to consult with counsel of their choice in all matters related to planned gift instruments, such as drafting of wills, trusts, agreements, contracts, or other. They shall be advised to consult with their attorney or accountant on matters related to the tax implications and estate planning aspects of a deferred gift agreement. If a representative of the institution makes a referral to an attorney, it shall be understood that the attorney is retained to represent the donor/client’s interests. The institution shall consult with legal counsel in all matters pertaining to its deferred gift program and shall execute no agreement, contract, trust, or other legal document with any donor without the service of legal counsel. Authorization for negotiation: Only the personnel approved by the Board of Trustees shall be authorized to negotiate on behalf of the institution with any donor with respect to gift annuities, trusts, life income agreements, and other formal planned gift instruments that are approved by the Board. Any agreements that involve a legal obligation on the part of the institution or its agents will require the approval of the governing board. Any real estate, real property, or hard-to-value assets exchanged for an agreement of any kind must be approved by the governing board.